Containment Procedures: SCP-578 is located within Site-22, inside a small steel lockbox. The object itself is to lie flat in the box, covered by a thick, dark cloth. Personnel required to monitor, clean, move, or interact with the object in any way are required to wear the specially provided goggles at all times. The location of the lockbox must be monitored or recorded by a high-definition camera to deter theft or malcontent. 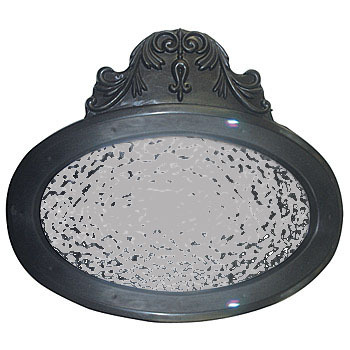 Description: SCP-578 is a small, round mirror measuring approximately 18cm in diameter. The frame is made of a smooth, silver-colored metal consisting of indeterminable substances. An ornamentation protrudes from one side of the mirror, engraved with various markings. The glass of the mirror exhibits visual properties similar to a liquid when active, despite feeling solid to the touch. All chemical and physical structure tests done with the mirror's glass have determined it to be 100% identical to normal glass. This leads to the hypothesis that the frame of the mirror is what provides the glass with its liquid appearance. To this date, all attempts to remove the glass have proven unsuccessful, as it appears to seamlessly bind to the metal. Destroying or damaging the mirror also proves unsuccessful. When SCP-578 is inactive, the glass will remain still with no ripples or movement, making it nearly indiscernible from a normal mirror by appearance alone. However, when SCP-578 is gazed upon by a living human being, it will activate and begin to produce a continuous ripple effect spiraling outwards from the center. Testing shows activation only occurs when the viewer can see the reflection of his or her own eyes in the mirror, leading to the use of specially tinted goggles for those handling the object. It does not appear to respond to any animals or electronic devices. When activated, SCP-578 appears to afflict the minds of those viewing it, leaving them in a state of unconsciousness. EEG readings of these subjects show a 92% correlation with the brainwave patterns of a normal REM cycle, suggesting they are dreaming. The subject remains motionless in this state for one full minute before returning to consciousness. While in this state, the subject becomes completely unresponsive to all external stimuli. It is believed that during this time, the subject experiences a vivid and detailed dream portraying an alternate life, from birth to death, in first person. Test subjects interviewed by Foundation psychologists reveal that the subjects are convinced to have lived an entire lifespan during the mere one-minute of unconsciousness. Subjects affected by SCP-578 often suffer from a variety of psychological effects, including but not limited to depression, delirium, dissociative fugue and anti-social behavior. Over half of the subjects affected are unable to return to a normal lifestyle and ultimately commit suicide, believing that this world and their current life is a fabrication. While specific details and knowledge from the so-called "dream" is not often recalled by test subjects, vague situations and partial understanding of the dream is still present in memory. A recent group test has shown that the subjects involved seemed to develop a stronger relationship post-experiment, either friendly or hostile. It is believed that SCP-578 places all its victims into the same dream world and will cross their paths during part of the experience. This causes a subconscious influence on each subject's opinions of the others, even after exiting the dream. Interviewing test subjects immediately after exiting SCP-578's dream state has proven to be difficult and inefficient. Earlier interviews ended with little to no information acquired and often tragic results. As a precaution, interviewees are now required to be counseled and medicated before discussing information directly related to SCP-587. To help alleviate the negative psychological after effects of the dream, use of Class A amnesiacs can be requested by the test subject, but only after all desired information is extracted from them. Sample interviews with test subjects can be found below for additional information. Dr. Paul ███████: So let's begin by telling me about what you experienced during your unconsciousness. Test Subject 578-A: What unconsciousness? What are you talking about? Dr. Paul ███████: You were put into an unresponsive state by SCP-578 for approximately one minute, during which your EEG readings reported that you were experiencing a dream. Now, can you remember what you dreamed of? Test Subject 578-A: Dream? No, it was my life, this is a dream… I thought I was about to die but now I'm here and… No, this is reality, isn't it?… Was it all really a dream? Dr. Paul ███████: Yes, it was all induced by SCP-578. So am I correct in assuming that you are unaware of whether or not your surroundings are real? Test Subject 578-A: I'm… this is… real? Dr. Paul ███████: Yes, this is real. Remember that you are a member of the Foundation, whose purpose is to secure, contain, and protect anomalous entities. Test Subject 578-A: Stop! Stop your lies! Wake me up now! I'm tired of this! I want to go back! Test Subject 578-A: No, I've had enough of this… This is just a dream! Dr. Paul ███████: Subject appears to be disruptive and unreasonable, interview will be resumed at a later time. Dr. Paul ███████: Please recall any details involving the other test subjects you encountered or remember from the dream. Test Subject 578-F: I don't remember much… I just know that ██████ makes me angry and — he's after my wife. We have to stop him! Dr. Paul ███████: Once again, Mr. ██████ is not a threat in this world. Also remember that you are not married in this reality. Test Subject 578-F: Ah… yes, I remember now… It's still very disorientating sometimes. Dr. Paul ███████: Completely understandable. Now, do you recall any situations involving the two other test subjects at all? Test Subject 578-F: No, the memories of them are rather fuzzy… But for some reason I feel like we've grown up together or known each other for a long time. Dr. Paul ███████: So even though you cannot remember who they were in your dream, you at least feel assured by being around them? Test Subject 578-F: Yes… it's like… I just know them from way back. Dr. Paul ███████: Interesting, even though you had not met each other prior to the experiment, your subconscious seems to have taken comfort in them. Do you notice any other effects SCP-587 might have on you? Dr. Paul ███████: Except what? Test Subject 578-F: It's so hard to sleep now… And I haven't had a single dream since.